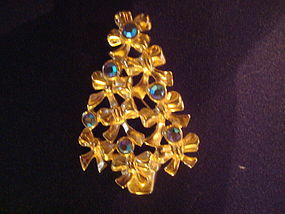 Lovely gold tone rhinestones and ribbons brooch in the form of a Christmas Tree. This lovely pin is signed Avon and measures 4 3/8" high and 1 1/2" wide. It features 6 aurora borealis rhinestones and is in fine condition. A very attractive holiday pin!! !